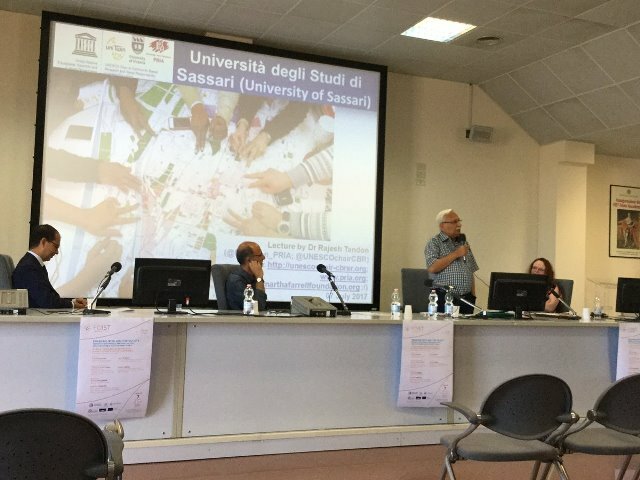 Dr Rajesh Tandon delivered a seminar at the University of Sassari, Italy on July 7, 2017, where he spoke on social responsibility of Higher Education, and their commitment towards the achievement of Sustainable Development Goals (SDGs). Dr Tandon also presented to the audience the UNESCO Chair open access publication; an e-book on ‘Strengthening Community University Research Partnerships: Global Perspectives’. He shared the key findings that emerged from the book, and outlined the importance of campus-community partnerships in research. He introduced to the audience the 6th GUNi World Report on Higher Education, titled ‘Towards a socially responsible university: Balancing the global with the local’. he shared the key messages from the report, which included the need to adopt an engaged approach towards Higher Education missions, responsibility to cater to local and global demands in the context of globalization, working collaboratively for pursuing public good, and building capacities for achievement of SDGs. Dr Tandon also talked bout the 5th GUNi Report and its key messages. Further he also mapped out the SDGs and the precise steps that Higher Education needs to take, in order to achieve those goals. Other speaker at the seminar included Dr Emma McKenna from Queen’s Univeristy, Belfast who address the PhD students at the university on tools of Responsible Research & Innovation (RRI).